Massive public hoardings, currently on display in various cities across the US, show Mary, pregnant with her soon-to-be-born baby son, Jesus, being led on a donkey towards the ancient Palestinian town of Bethlehem by her husband Joseph. Confronting this weary family is not the occupying forces of the Roman Empire, as in ancient accounts of the nativity, but rather it is the occupying forces of the Zionist Israeli regime. The billboards, organized by campaign group IfAmericansKnew.org, show the present-day reality of Bethlehem, the town where Jesus is reputed to have been born nearly two millennia ago. Gone are sword-wielding Roman centurions, replaced by Uzi machinegun-toting Israeli soldiers. But the essential story remains the same one of foreign military occupation and oppression of innocent civilians. Indeed, given technological advances, it is easily arguable that today’s occupation of Bethlehem and other Palestinian communities is much more brutal and oppressive under the Israeli regime than it was under Caesar. At this time of year, millions of Christians around the world, as well as Muslims and many other faiths, celebrate the event of Jesus Christ’s birth as a sign of hope for humanity. This hope stems from the fact that, amid physical conditions of extreme privation and injustice, a baby was born into this grim world. Yet, it is peculiar that while this historic event is venerated across the world, often in exalted cathedrals of opulence and splendour, the harsh reality of Jesus’ birth and its significance is weirdly sanitized and reduced to a sentimentalized travesty. Today, Bethlehem, as for other parts of the Palestinian Occupied Territories, continues to be under an illegal and brutal siege. The town of some 22,000 inhabitants is cut off from the outside world by an eight-meter concrete wall built illegally by the Israeli regime. This regime, based in Tel Aviv, has violated countless international laws since 1948 until today, including the UN Charter and Geneva Conventions, to dispossess more than 95 per cent of historic Palestine and to turn that entire territory into an apartheid police state, where Palestinian Christians and Muslims are killed, kidnapped, imprisoned and thrown out of their homes with total impunity. That duress includes Palestinian babies born literally on roadsides and in makeshift dwellings because of heinous, inhumane Israeli travel blocks. On Christmas Day this week while the world was “celebrating” the historic birth of Jesus, a three-year-old Palestinian girl, Hala Abu Sbeika, was being buried. Hala was killed the day before by an Israeli air strike on the Gaza strip, allegedly in retaliation for the fatal shooting of an Israeli defence worker. It was the usual disproportionate criminal response from the barbaric occupying Zionist regime, which regularly and indiscriminately kills thirteen times more Palestinians for each Israeli fatality. Bethlehem is also surrounded by four large Israeli settlements – each the size of a city and each of them built illegally in contravention of international law. This Israeli construction has been at the expense of the farmers and shepherds of Bethlehem, whose land is confiscated and ring-fenced. Also confiscated is Palestinian water. Israeli occupiers enjoy limitless supply of water for their villa swimming pools and gardens, while Palestinian farmers and families share dilapidated pipes that routinely run dry. Christian Palestinians who wish to visit Bethlehem from others parts of the West Bank or Gaza and from other Arab countries are prevented from doing so by the Israeli occupiers. As Press TV’s correspondent Nel Burden reported this week, even in this special week of Christmas commemoration, the grounds given for denying entry to Bethlehem by the Israelis is a vague, callous one of “security”. This arbitrary prohibition on people celebrating their religion is a calculated insult by the Israeli regime, and no doubt is part of its long-term campaign to further depopulate Palestinian territories and “cleanse” the demographic facts on the ground. In short, the Israeli military assault on Bethlehem and Christmas is but just one facet of the wider genocide against Palestinians. That genocide is allowed to happen largely because Western governments in Washington and Europe either support the Israeli regime with billions of dollars a year in military aid or, at best, refuse to hold Tel Aviv to account under international legal standards. There are no grey areas in this matter. Either we oppose the genocide or we support it through varying degrees of complicity. This is a matter that affects all human beings, whether Christian or Muslim, or any other. And the growing commercial and cultural boycott of Israel by citizens around the world is proof of a global awakening despite the moral torpor of their governments. Ironically, as Western political leaders send out their usual perfunctory Christmas messages proclaiming goodwill, and while many of them attend church ceremonies paying homage to the Christian nativity story, these same leaders are blind to the ongoing real and urgent meaning of that beautiful story. Believers hold that Jesus came into this world as a sign of hope of human victory against injustice and oppression, and as a promise of world peace. Fulfillment of that promise depends on what other human beings do about it. In today’s world, the Christmas story is as relevant and as powerful as ever. 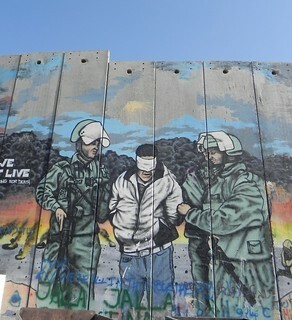 The same location and circumstances of Bethlehem should make that shockingly obvious. Gaza is mourning the death of a three year old girl killed in a recent Israeli airstrike on the besieged enclave. Thousands of people gathered to bury the body of Hala Abu Sabakha who was killed in an Israeli bombardment on Tuesday. Sabakha and another Palestinian were killed and six others injured when Israeli warplanes pounded several areas in the besieged Gaza Strip. The Israeli bombing came shortly after a Palestinian sniper shot dead an Israeli along a border fence in the north of the coastal enclave on Monday. The shooting of the Israeli seemed to be in retaliation to the recent killing of several Palestinians by Israeli forces. Christians from around the world flocked to Bethlehem to celebrate Christmas. The festivities were marked with marching Palestinian bands, concerts and the coming of the Latin Patriarch, a yearly ritual where he makes his pilgrimage from Jerusalem al Quds to Bethlehem to conduct prayers in the Church of Nativity. However the Palestinian Minister of Tourism Rula Ma’ay’a explained to me that although thousands of Christians are coming from around the world to Bethlehem for Christmas, there are serious challenges for people living in Gaza, as Israel often banned them from entering Bethlehem. This entry was posted in All Posts News Politics and-or Videos, Dandelion Salad Videos, Gaza, Human Rights, Israel, Israel-Palestine-Gaza-Occupation, Palestine, Politics and tagged Bethlehem, Christmas, Christmas on Dandelion Salad, Cunningham-Finian, Finian Cunningham. Bookmark the permalink.